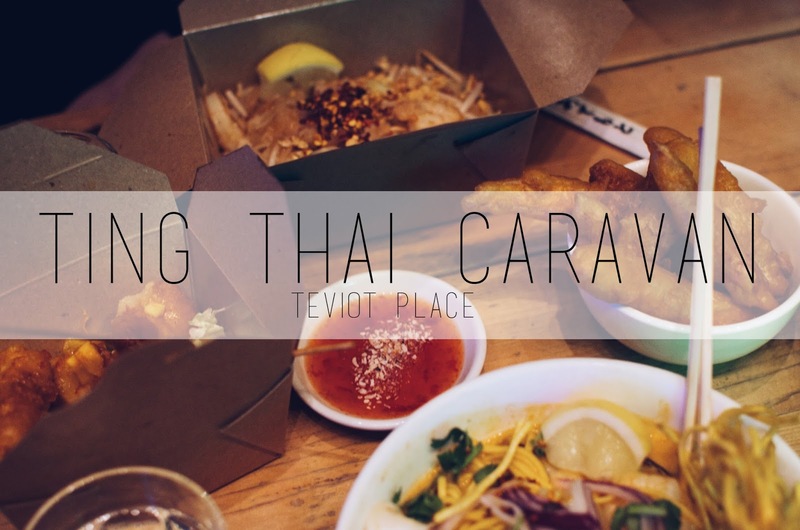 Disclaimer: Ting Thai Caravan is not actually located in a caravan... it is actually conveniently located just off the Meadows on Teviot Place. Ting Thai is one of my favourite places for some quick Thai street food – I'm even willing to wait outside in the freezing weather to get a table here so it must be delicious. Ting Thai Caravan's décor is certainly hipster inclined, I always end up sat next to this neon green picture that features a little white bichon frise sticking its head round – pretty weird but I love it. It consists of a small room with some benches, some window bar seating and a couple normal tables so it's one of those places you have to share your table with strangers. While that doesn't bother me too much (obviously I'd rather my own table but sometimes I get to see what other people are ordering and it prompts me to try something new on the menu) I know for a fact this is a place my mother would never step foot it. There is pretty limited amount of seating and no reservations taken so you will most likely have to wait for a table (outside in the cold as there is no where to wait). Normally in places like these with limited seating I'd recommend eating there on a weeknight but Ting Thai is pretty popular with students so it seems to be busy everyday at peak dinner times. I've never had to wait too long, but I've also never been seated right away. That being said, I definitely think the food at Ting Thai is worth the wait. 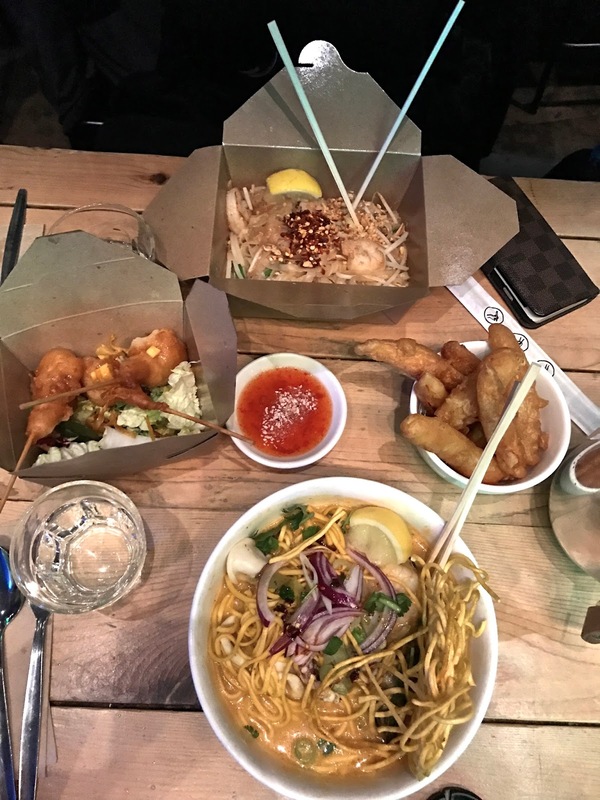 Street food inspired by Thailand, a lot of the dishes literally come in to-go boxes (pretty convenient for takeaways – which is an option for those who don't want to wait) and you'll find a little metal teapot at your table to refill with water from a little fountain. 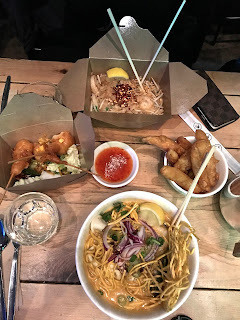 The menu isn't extensive, but everything I've tried so far I've loved – even when I manage to make myself venture away from my beloved Pad Thai. The servers are laid back but pretty friendly. While you've probably had to wait a while on getting a table, the actual food comes really quickly. My top recommendations are obviously the Pad Thai (which I have to force myself not to order every time) and the Khao Sawy Talay for seafood lovers. The Khao Sawy Talay features the absolute biggest mussels I've ever seen in my life alongside prawns and squid in a creamy massaman curry broth alongside both soft and crispy egg noodles. Really flavoursome and so filling. My friend has also tried the Seabass Maeklong (a seabass fillet in a lemongrass, ginger, shallot, cashew and coconut curry) with a side of coconut rice and really recommends it. In terms of sides I always order the Goong Frong Beer with are deep fried 'bubble prawns' (quite a thick, cakey batter) with a slight mango salsa, sweet chilli kind of sauce. I've also had the Mun Tod which are sweet potatoes slices deep fried in the same bubble batter with a sweet chilli sauce. All the dishes I've tried are packed full of unique flavours and are super filling despite not being too expensive. There are lots of delicious options on the menu for meat eaters, gluten free (very clearly marked) and pescetarians but I will say that it is quite limited for veggies and vegans. Keep in mind that Ting Thai currently only take cash, and the menu prices are lower before 6pm – so a good time to try them out for the first time is at lunch. I'm keen to go back to Ting Thai soon to try more of their menu since I've loved everything I've tried so far, so keep an eye out on my Instagram for updates on what I try next. And if you're not into sharing your table with strangers, Ting Thai is definitely worth getting to take away.